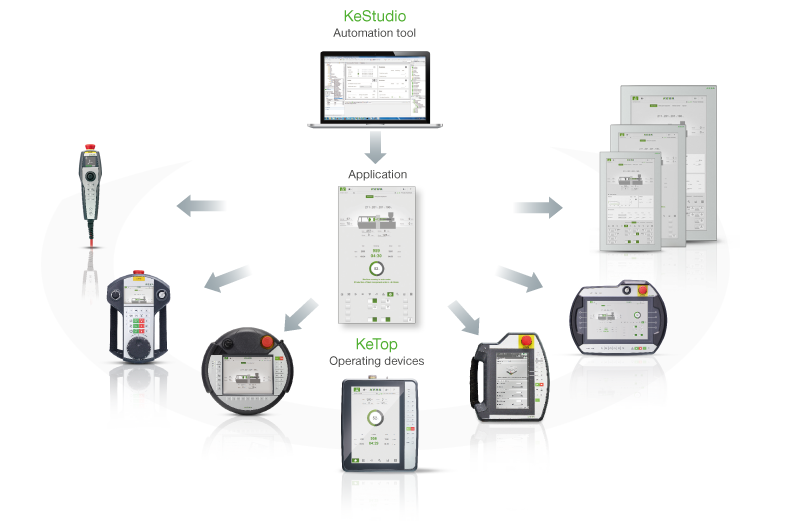 With KeTop, KEBA offers both stationary as well as mobile operating devices for easy implementation of all possible visualization and operating tasks. Performance and size of the devices are scalable; depending on the model, membrane keyboards, touchscreens as well as multitouch monitors – on request with unique haptic elements – are available. Maximum ergonomics and best-possible operating efficiency have priority and ensure maximum productivity. Another strength of the KeTops are the extensive customization possibilities that allow the customer to make specific modifications to hardware and software. 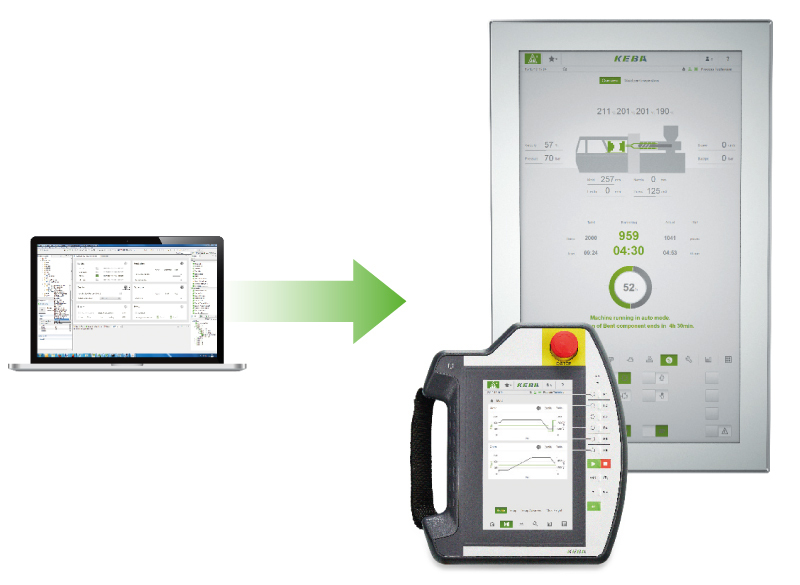 All mobile and stationary HMI applications can be created with only one software. 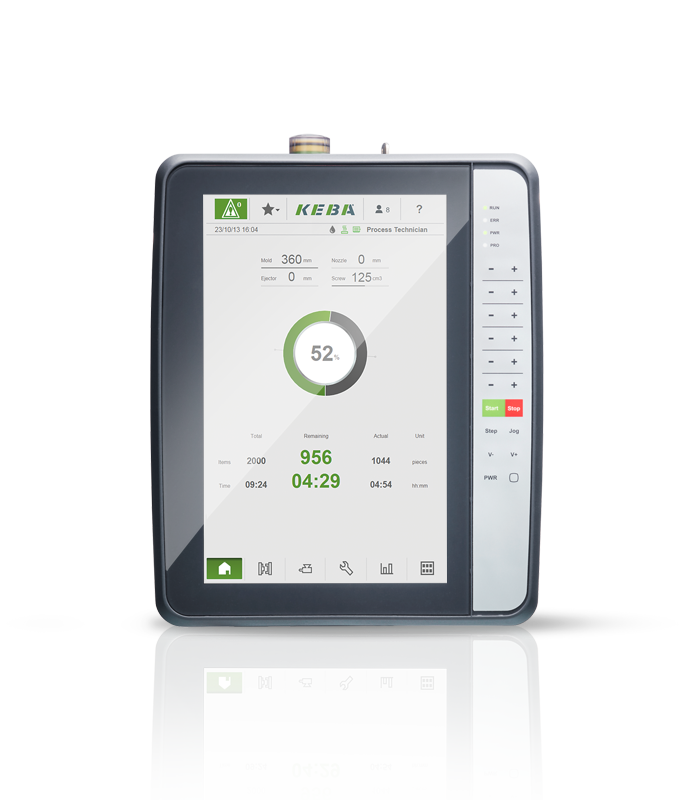 With KeView, KEBA is offering an extensive framework of tried-and-tested HMI components for easy and efficient creation of visualizations. The ready-made elements are arranged into finished visualization masks using drag & drop without needing to program a single line of code. 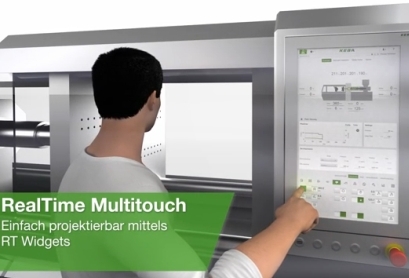 Depending on the software configuration level selected, integrated multitouch gestures as well as a central styling mechanism are available in addition to high-performance widgets and versatile graphic options. SW modules on a JAVA basis can be integrated flexibly for customized extensions. The operating devices are perfectly equipped for any use with the three options: Embedded, Trend and Style. Embedded contains only an operating system and also forms the basis for the Trend and Style versions. The level Trend also contains a standard visualization application and the Style variant offers modern multitouch visualization. 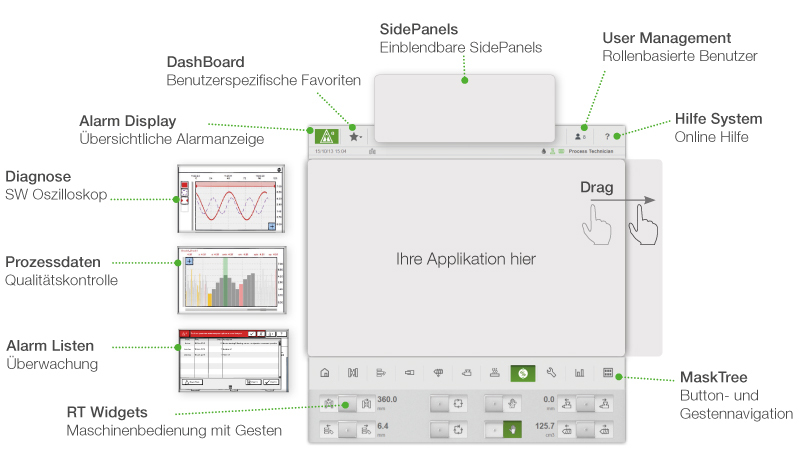 Starting from level KeView Trend, an HMI software program for efficient use and fast visualization creation with the help of a powerful function library - even without programming knowledge - is available with KeView. 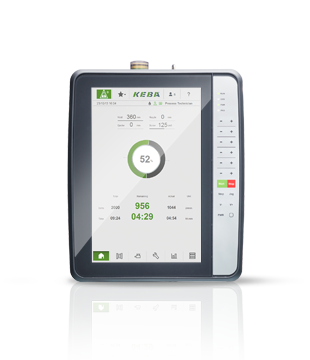 Thanks to freely definable widgets and excellent interaction with KEBA operating devices, a short time-to-market is ensured. Freely programmable JAVA extensions open the door to nearly unlimited applications. 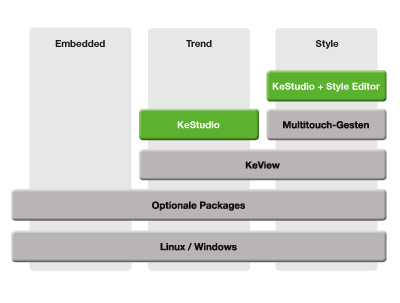 KeView Style is based on the latest Java 8 with JavaFX. Innovative application concepts can be easily implemented using the graphic designer in KeStudio. 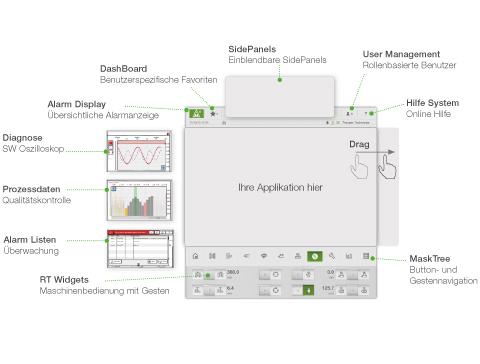 With the integrated multitouch gestures and the diverse graphical possibilities, it is very easy to create modern HMI applications. A machine can thereby be operated as intuitively as a smartphone. 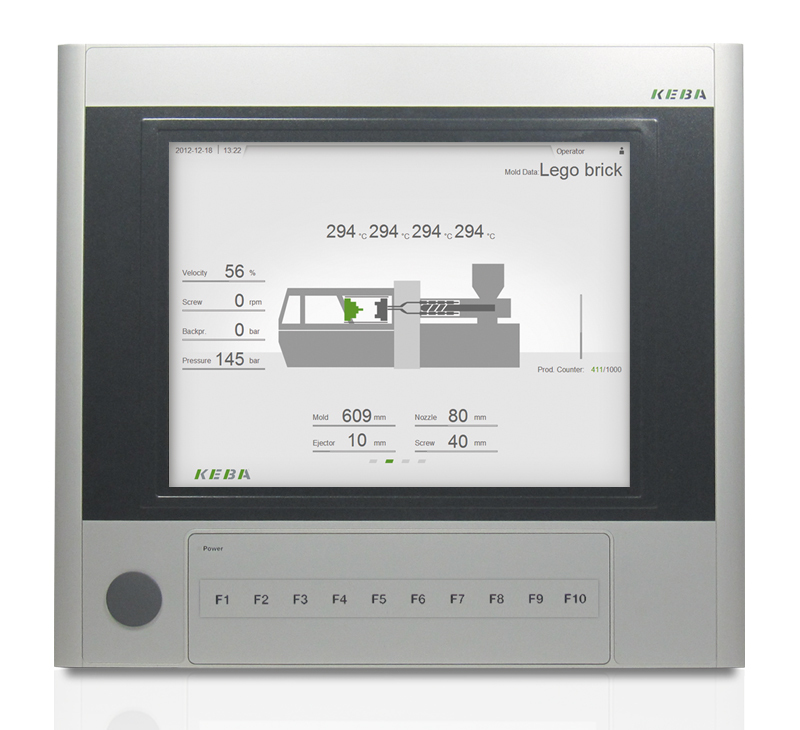 With the RealTime Widgets developed by KEBA, a machine can be directly operated in real-time. 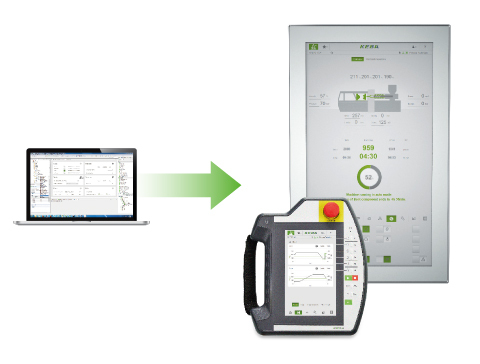 By means of this innovation, hardware variants can be reduced and the HMI can be used to create a true user experience. The proven reliability of the KeTop operating devices for uncompromising use in rough industrial environments is ensured by their sturdiness, safety and quality. Full functionality, even after collisions with hard objects, falls from up to 1.5 m as well as contact with oily liquids, is guaranteed. All KeTop operating panels feature a three-level enabling switch which can be operated without the use of force. It immediately recognizes cramping and panic reactions of the operator and brings the machines into a safe state reliably and without delay. In order to increase the operational safety of the devices, state-of-the-art FE computer simulation was used for the design. The result of this research work were the ergonomically designed shapes and the double-walled housing. High-quality materials and processing complement the well-designed solutions for every situation. 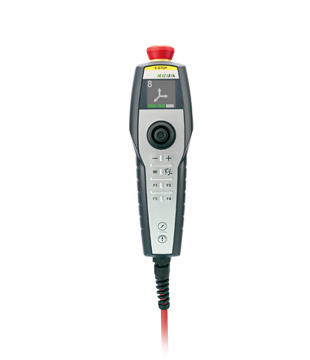 The KeTop T10 directMove detects its position and direction in three-dimensional space. The operator can therefore easily specify the desired movement or rotation of the robot TCP by indicating in the direction of motion and then operating a small joystick. 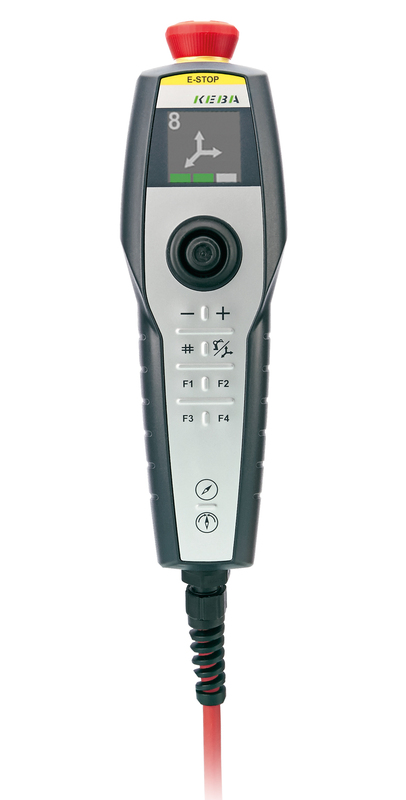 With the KeTop T10 directMove, the individual path points are thereby determined and adjusted. If necessary, standard operating devices and screen devices such as laptops can also be used for programming. Maximum flexibility is achieved through four operating modes that are displayed on the 1.5" color display using icons. 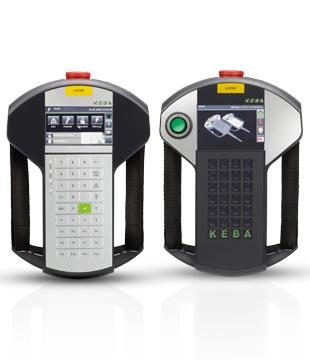 Handheld operating devices of the KeTop T20 series are compact, lightweight and feature a high-performance ARM-Cortex A8 processor. They are very versatile and can be equipped with various optional operating elements, such as key switches, push buttons, hand wheel and/or axis selection switch. The low weight and the compact and ergonomic design enable long, fatigue-free operation. The devices are equally suited for left- and right-hand operation and can be optimally adapted to the user's hand by means of an adjustable strap. 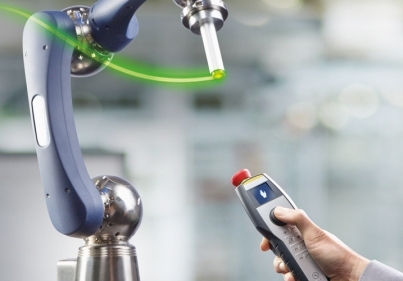 The KeTop T55 is a high-performance handheld operating device for operating and teaching robots and machines. 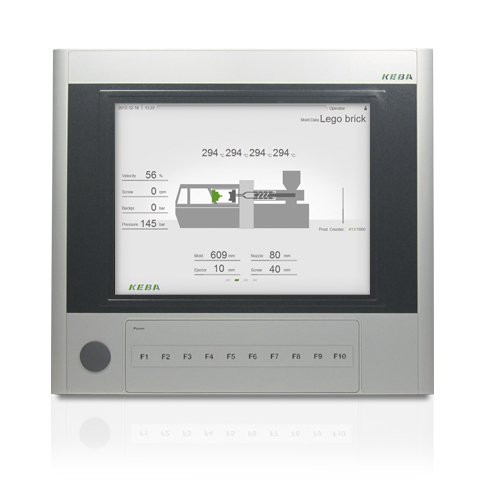 Even complex processes can be displayed clearly due to the high-contrast 6.5” TFT display. The round shape and the double-walled housing ensure shock resistance for drop heights of up to 1.5 m. With its many grip and holding positions, the KeTop T55 can be used comfortably and fatigue free by right- and left-handed persons. 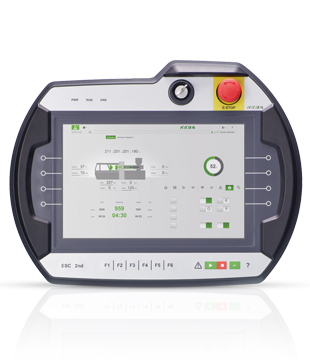 The mobile KeTop T70 terminal with its high-resolution display and quick processors is perfectly suited for challenging visualization and operation applications. The robust housing is ergonomically designed and light; it enables long and fatigue-free operation. 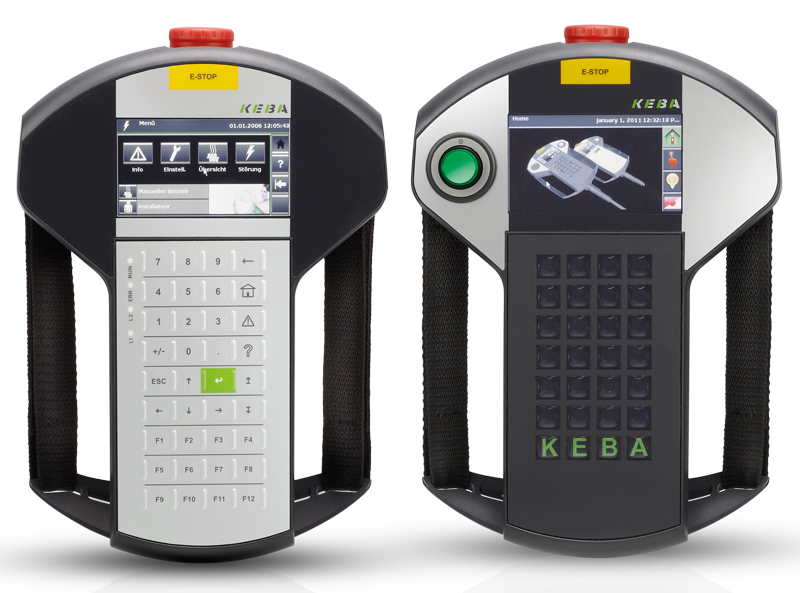 Unique features, such as growing application performance as well as an additional, optional keyboard at the rear side of the device, make the KeTop T70 a long-lasting and versatile handheld operating device. The operating elements located along the edge of the housing can also be easily and precisely activated. 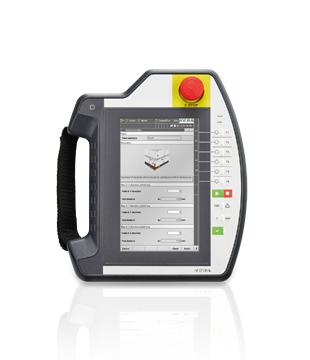 The KeTop T150 features a capacitative touchscreen with real multitouch operability, which facilitates intuitive use, maximum ergonomics, and the best possible user experience. In spite of a display size of 10 inches, the KeTop T150 is a real lightweight. The KeTop T150 features a modular design. Switching to newer processor technologies due to increasing application requirements is quick and easy. Depending on requirements, the KeTop T150 is available both with Linux as well as Windows IoT Enterprise. Optional features, such as energy storage and RFID, make many additional usage scenarios possible. 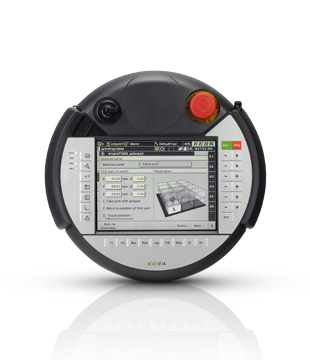 The mobile KeTop T200 terminal features an ergonomic housing with brilliant, HD-ready display. 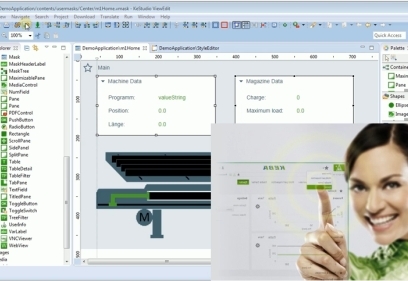 Fast processors make possible demanding visualization and operating applications. With integrated safety elements, performance on a PC level and Windows Embedded Standard 7®, it is a full-fledged replacement for stationary panels. 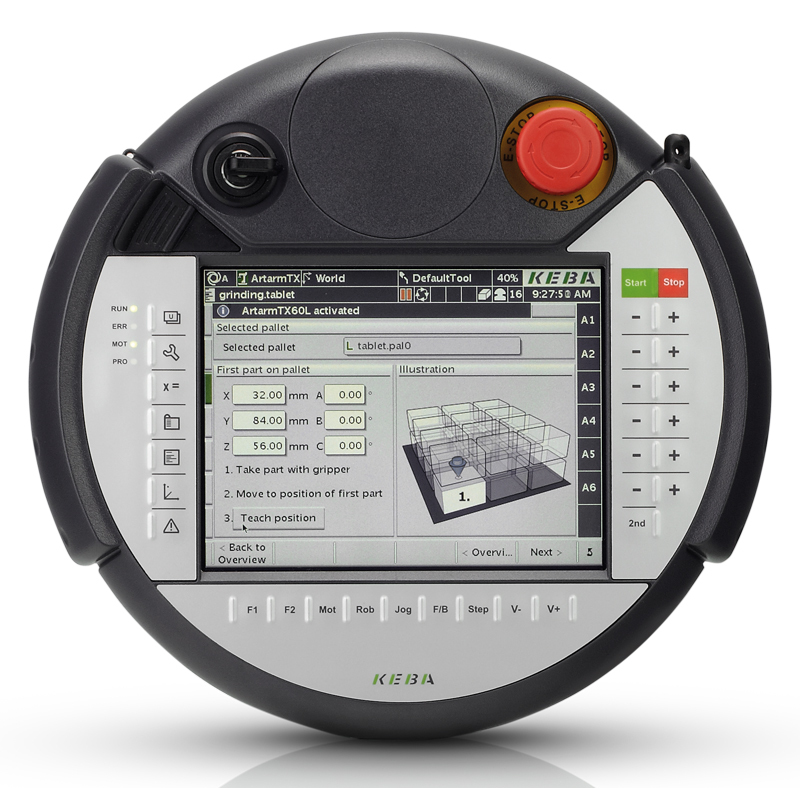 Unique features, such as the modular construction, which facilitates easy upgrades to newer processor technologies as application requirements grow, as well as an additional, optional keyboard on the rear of the device make the KeTop T200 a versatile handheld operating device built for the long term. 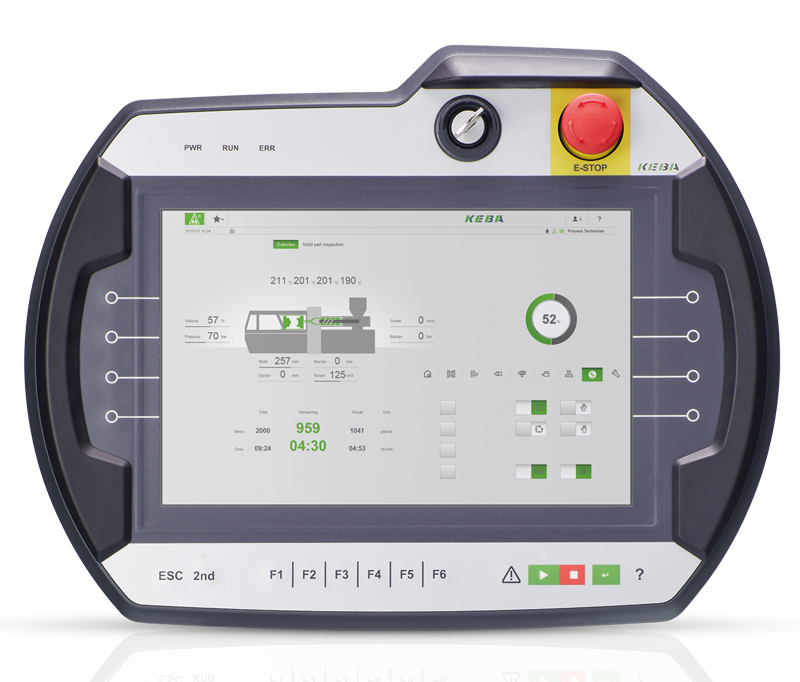 The new KeTop AP500 panel line offers robust gesture operation though an industrial multitouch with integrated touch booster for use with gloves. 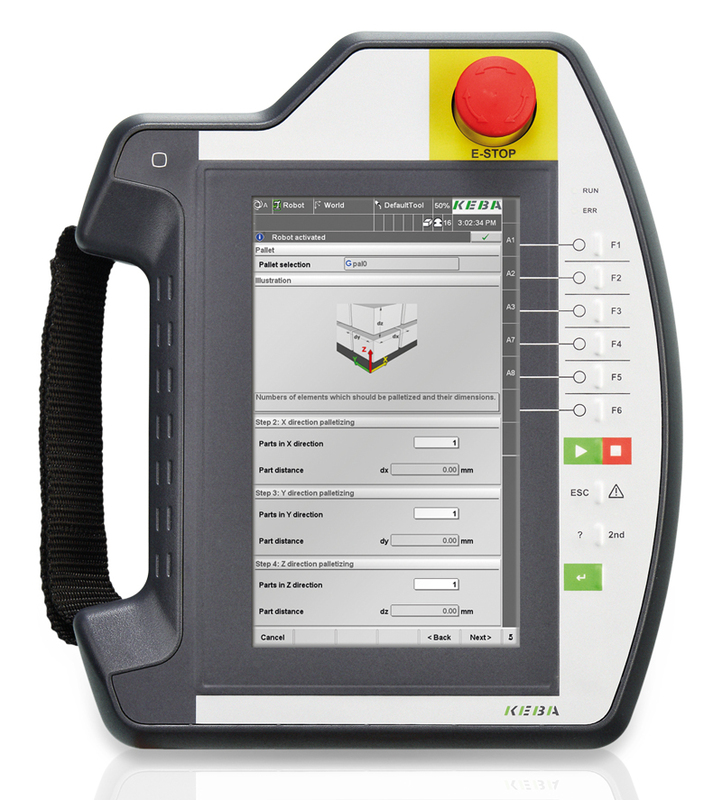 The RealTime Multitouch is able to transmit user interactions directly to the control in real-time via EtherCAT or ProfiNet. Embossed, haptic elements enable reliable operation, even when the user glances away from the operating panel. Cost optimization by combining the rugged Cfast and economical SD cards, which are utilized depending on the required tasks. Thanks to the snap-in locking mechanism, it is possible to install the panel with just one person. The perfect match of hardware and software enables the most simple way of creating customer-specific visualization. In addition, you benefit from easy, reliable and quick commissioning. This makes many mechanical built-in elements and membrane keys a thing of the past.